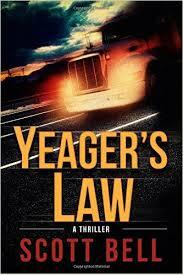 Scott Bell’s debut novel, Yeager’s Law, shows Bell is very adapt at keeping many different story lines going at the same time. The story moves quickly, is a fun read, and introduces readers to a new character they can fully root for. Abel Yeager hit hard times after his service in the Marine Corps ended. He entered civilian life looking to make a living hauling materials as a trucker, but he inadvertently kills a pregnant woman after she stops too quickly in front of him and causes an accident. He is held liable by the insurance company and, unknown to him at the time, a very dangerous man. Trying his best to stay one step ahead of the bills that are piling up around him, Yeager takes on jobs that have him hauling cargo across the country. During one such job, he finds himself the victim of an attempted hijacking and we see his Marine Corps fighting skills come to life. He dispatches the would-be thieves with the help of an ordinary woman who happens to be a gun toting book store owner who comes out of her comfort level and plays hero right when Yeager needs it most. As a way to pay her back for her help, Yeager agrees to haul a few pallets of books for her at a cheap rate. What neither one of them realize is there is dangerous cargo hidden in the pallets of books. Mix in the fact that the father of the woman killed in his trucking accident is hell bent on revenge and you get a novel that has a lit fuse that's burning towards an explosive ending. I found Bell’s debut to be an enjoyable read. The plot moves a long nicely and his main character is a man of conviction, with a wealth of deadly skills learned during his time in the Corps. While some parts of the plot seemed to come together a little too conveniently for my taste, there is plenty to like here and I hope that Bell pens another novel, hopefully featuring this dynamic main character, sometime in the near future.